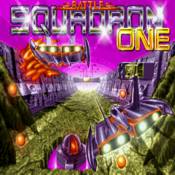 In 1989 it received an amazing 109% rating... in 2012 it is the world's first 2-player split-screen shooter on iPad..
... Battle Squadron ONE, the Amiga legend, has finally arrived on iPhone/iPod/iPad !! After just a few weeks on the App Store an amazing 92% of 50+ players rated Battle Squadron ONE with 5 stars!! See www.cope-com.com for player comments. Your mission: Earth has been long at war with the evil alien Barrax empire, with extensive losses on both sides. Your two fellow commanders, Mayers and Bergin, have been taken hostage by a Barrax Nova Cruiser and are held hostage on the alien Barrax home world, Planet Terrainia. You must destroy the Barrax home world to rescue your fellow commanders !! - Nova Missile for when you "get caught in a tight spot"
So engage and destroy... "Welcome to Battle Squadron !!"